Senegalia brevispica was formerly known as Acacia brevispica. It was reclassified after molecular phylogenetic studies resulted in the transfer of many Acacia species into the genera Vachellia, Senegalia, Marioussa and Acaciella (Kyalangalilwa et al., 2013). The acacia species Senegalia brevispica (Harms) Seigler & Ebinger (formerly Acacia brevispica Harms) is a fast growing, thorny acacia species that provides valuable fodder to goats and cattle in dry and semi-humid areas of Eastern and Southern Africa. Senegalia brevispica is a thorny shrub that reaches a height of 2.5-4.5 m, sometimes growing as a slender tree up to 7 m high (Bekele-Tesemma, 2007; Skerman, 1982). Senegalia brevispica can form dense thickets or scramble over other plants (Bekele-Tesemma, 2007). 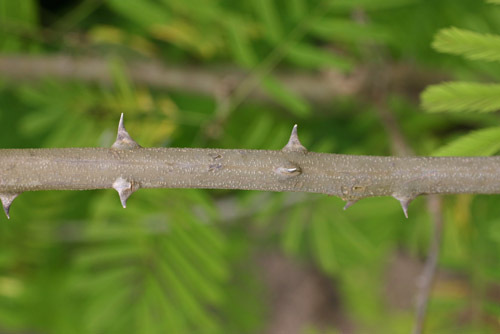 It has long, thin, rambling branches covered with numerous small, mostly hooked thorns. The thorns are scattered along the branches. The leaves are pinnately compound, consisting of 5-20 pairs pinnae. The leaves are fairly large with a leaf stalk about 10 cm. The flowers are yellow white in colour, fragrant, clustered in globose heads, on branching stalks to 10 cm. The fruits are flat, straight, up to 15 cm long pods. The husks are brown and so thin that the seeds inside the pods are visible (Skerman, 1982). Pods are dehiscent and split open easily on the tree (Bekele-Tesemma, 2007). Senegalia brevispica is mainly used as a forage tree whose foliage, pods and seeds are readily eaten by goats. It is used as firewood and live fence. The roots are used in ethnomedicine (Bekele-Tesemma, 2007). Senegalia brevispica is native to Africa and widespread in Sudan, Ethiopia, Somalia, Kenya, Zaire, Angola, Natal and Cape Province. In Kenya, it occurs at 1600 to 2000 m above sea level, where it often forms dense thickets on well-drained slopes in deep and fertile red soil (Skerman, 1982). In Ethiopia, it can be found between 400 m and 2000 m in the southern rangelands of the Borana Plateau (Coppock, 1994). Senegalia brevispica is common in dry as well as semi-humid parts of Africa (Bekele-Tesemma, 2007). Senegalia brevispica can be propagated through seedlings or direct sowing no deeper than 3 cm. It grows relatively quickly and coppices readily. First height pruning and stem reduction helps to improve the stalk (Bekele-Tesemma, 2007). In the wild, although large seed production occurs during the warm and dry season, the recruitment of seedlings is very low (Coppock, 1994). Because of its thicket formation, Senegalia brevispica can be a troublesome weed in pasture and it may be necessary to control its growth. When the trunks are cut down, they sucker profusely and regenerate easily, even after burning and clearing (Bekele-Tesemma, 2007; Skerman, 1982). In the 1990s, severe control methods were suggested such as digging out the trees for full control, repeated burning, or repeated spraying of the foliage with herbicide (2,4-D) mixtures. Spraying was recommended four to six months after cutting (Skerman, 1982). However, more recent research has been less negative. In semi-arid rangelands in Ethiopia, in spite of Senegalia brevispica encroachment, 23 grass species could be found in the sub canopy or in the surroundings of this shrub. The most important sub-canopy grass was red oat grass (Themeda triandra). Sub-canopy grasses were reported to yield better than on open lands. It was thus suggested to moderate the control of Senegalia brevispica (Tefera et al., 2010). Senegalia brevispica leaves are quite rich in protein (about 13-24%), depending on maturity and on the amount of lignous material included in the browse. Because of the presence of both soluble and condensed tannins (proanthocyanidins), Senegalia brevispica digestibility may be underestimated (Reed, 1986). Senegalia brevispica leaves, flowers and young pods are browsed to a considerable extent by goats and sheep, but seldom eaten by cattle because of the thorny branches (Skerman, 1982). The leaves are among the preferred leaves by camels in Ethiopia (Bekele et al., 2013). Numerous browse species reported to be part of Ethiopian and Kenyan rangeland, among which Acacia abyssinica, Senegalia brevispica, Acacia mellifera, Acacia nilotica, Senegalia senegal, Acacia seyal, Acacia tortilis, Balanites aegyptiaca, Grewia bicolor, Grewia tembensis, Rhus natalensis, Vernonia cinerascens, Ziziphus mucronata, Albizia coriaria, Albizia amara and Maerua angolensis were assessed for their chemical composition and in vitro DM digestibility (IVDMD). During both dry and rainy seasons, Senegalia brevispica was found to rank high for protein content, and to have lower NDF and lower total condensed tannins than others browse species. However, Senegalia brevispica IVDMD was among the lowest (Abebe et al., 2012; Ondiek et al., 2010). Senegalia brevispica also belonged to the group of higher potential degradability within 48h (Ondiek et al., 2010). The same experiment reported that in vitro OM digestibility was only medium (Ondiek et al., 2010). This result is in accordance with a former conclusion on the medium nutritive value of Senegalia brevispica among other acacia species in the Rift Valley of Kenya (Abdulrazak et al., 2000a). The authors of those experiments all concluded that the assessed browse species had potential value for ruminant feeding. In addition, it was reported that the use of Japanese yeast could enhance ruminal fermentation of those browses (Wambui et al., 2012; Wambui et al., 2010). The in vitro OMD of Senegalia brevispica pods after 48h was 559 g/kg DM. In Kenya, foliage of Senegalia brevispica was offered as a protein supplement to goats fed on a Rhodes grass hay-based diet, during the dry season. It had high protein content, low tannins and provided the highest amount of lipids among other foliages of legume trees assessed in the experiment. The relative high protein content of the browse (15-25% DM) advocated for the use of the browse leaves to supplement crop residues such as straw and/or low-quality pastures. The NDF content of the browse species was low to moderate, indicating a potential high digestibility. Browse fibre was shown to be more digestible than crop residue and mature grass hence could be easily utilized by animals (Kemboi et al., 2017a; Kemboi et al., 2017b). 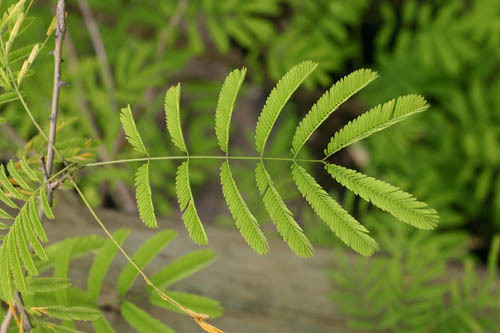 In Ethiopia, sheep and goat wethers fed during 18 days ad libitum tef straw and vetch (Vicia dasycarpa) supplementation, or Senegalia brevispica leaves or sesban (Sesbania sesban) leaves in order to replace 33% or 67% of vetch, had lower N retention on acacia foliage than on sesban foliage. Tannins of Senegalia brevispica may have decreased protein digestibility by the formation of indigestible tannin-protein complexes (Woodward et al., 1997). In an earlier experiment, the level of tannins or lignin brought by Senegalia brevispica had been suspected to be the cause of a low palatability of the diet. This decrease in palatability was higher in sheep than in goat wethers (Woodward et al., 1995). Senegalia brevispica leaves were fed as a protein supplement to sheep in the Borana region of Kenya. Three other protein supplements were assessed: babul (Acacia tortilis) pods, cowpea (Vigna unguiculata) hay and alfalfa (Medicago sativa) hay. The supplementation with acacia leaves resulted in lower DM intake than with other forage legume products, and it also resulted in lower DM and OM digestibilities than other products. Supplementation with forage legume products always resulted in lower grass intake but it increased N intake by 71% on average, compared to the control, and acacia diets were higher than cowpea and alfalfa diets. Growth rates and diet conversion efficiency for supplemented sheep were increased (P<0.01), compared to the controls by an average of 74 and 54%, respectively (Coppock et al., 1992). In Kenya, the overall diet of goats fed Senegalia brevispica pods had higher protein digestibility and ammonia concentration. Goats had higher feed intake, but did not grow as fast as goats fed on other browse species pods such as those of umbrella thorn (Acacia tortilis) or babul (Acacia nilotica) (Sawe et al., 1998). In Ethiopia, leaves of Senegalia brevispica, babul (Acacia tortilis) pods, cowpea (Vigna unguiculata) hay and alfalfa (Medicago sativa) hay were included in calf diets in the range of 300-380 g DM/d (as fed basis). These forage legumes were assessed for their use as protein supplements in the diet of calves receiving a native grass hay based diet (mixture of Hyparrhenia, Andropogon and Pennisetum spp.). Calves supplemented with forage legumes were allowed to graze dry season forage. The higher feed intake was for alfalfa hay and babul pods (86%), lower (71%) for Senegalia brevispica leaves and cowpea hay. N intake was the lowest for Senegalia brevispica leaves (8.1 g/d) and calf growth rate on acacia leaves could not compare with that on alfalfa. All supplemented diets increased N intake, growth rate, and liveweight gain of calves compared with the control. Supplementation decreased the overall DM intake of the calves. The use of Senegalia brevispica leaves, in spite of their low DM yield and the difficulties in harvesting them by hand due to their prickly stem, was encouraged since it could help controlling this species in the higher elevations of the Borana region of Ethiopia (Coppock et al., 1992). No publication was found in the literature on the use of Senegalia brevispica in rabbit feeding (2017). The foliage of this acacia, rich in protein but also in tannins, is more or less well consumed by sheep and goats (Osuga et al., 2008; Woodward et al., 1995), and the leaves are preferred by camels (Bekele et al., 2013). Senegalia brevispica foliage may thus be considered as a potential forage for rabbits, at minimum at a low level (4-5% of the diet) as it was demonstrated for other acacia foliages rich in tannins such as Acacia nilotica (Mashamaite et al., 2009).